With 109 provincial government employees per 1,000 residents, NL has one of the largest public sectors in Canada, and the largest in the Atlantic region. The national average is 83 per 1,000. The Atlantic average is 96. 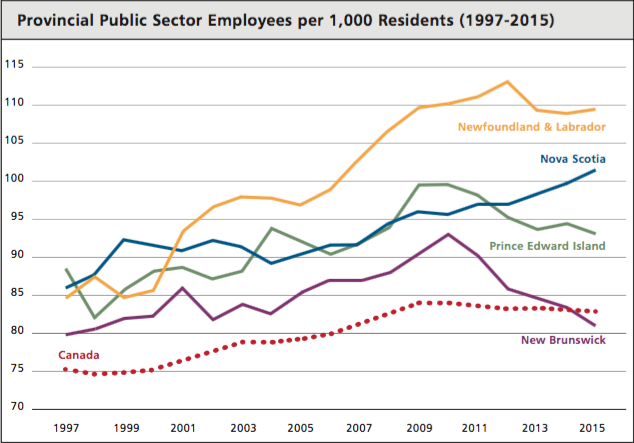 Since 1997, NL’s public sector has grown considerably, ballooning by a stunning 30 percent. Over this period, the national average rose 10 percent. P.E.I. and New Brunswick sectors have shrunk since 2010. Nova Scotia’s has grown 5 percent. NL’s current level roughly equals its 2010 number, having peaked in 2012. 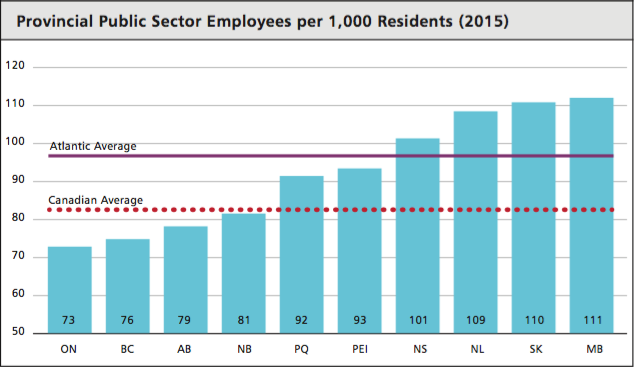 NL pays public servants, on average, $70,149 per year and employs 27 employees per 1,000 residents above the national average. Had the province employed only the average number of persons in 2015, it would have saved nearly a billion dollars and balanced the budget.